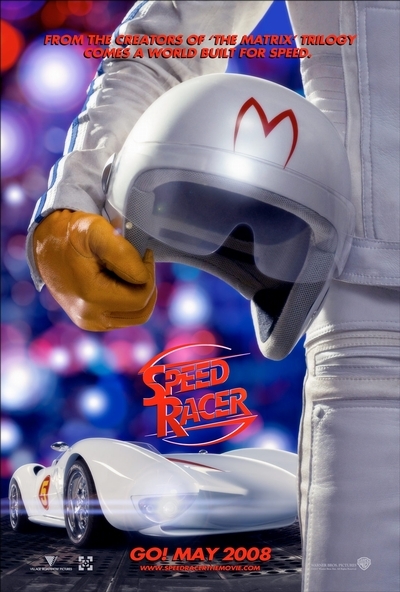 Story: Hurtling down the track, careening around, over and through the competition, Speed Racer (Emile Hirsch) is a natural behind the wheel. Born to race cars, Speed is aggressive, instinctive and, most of all, fearless. His only real competition is the memory of the brother he idolized - the legendary Rex Racer - whose death in a race has left behind a legacy that Speed is driven to fulfill. Speed is loyal to the family racing business, led by his father, Pops Racer (John Goodman), the designer of Speed's thundering Mach 5. When Speed turns down a lucrative and tempting offer from Royalton Industries, he not only infuriates the company's maniacal owner (Roger Allam) but uncovers a terrible secret-some of the biggest races are being fixed by a handful of ruthless moguls who manipulate the top drivers to boost profits. If Speed won't drive for Royalton, Royalton will see to it that the Mach 5 never crosses another finish line. The only way for Speed to save his family's business and the sport he loves is to beat Royalton at his own game. With the support of his family and his loyal girlfriend, Trixie (Christina Ricci), Speed teams with his one-time rival - the mysterious Racer X (Matthew Fox) - to win the race that had taken his brother's life: the death-defying, cross-country rally known as The Crucible.